Also known as laryngotracheitis or laryngotracheobronchitis, croup1 is a primarily pediatric viral disease affecting the larynx and trachea. Though it may resemble a simple cold at first, the infection causes a loud barking cough and stridor (unusual, high-pitched breathing noises indicating partial airway obstruction). The majority of croup cases are caused by parainfluenza viruses (types 1, 2, and 3) but a variety of other viruses can lead to croup symptoms. The central problem for patients with croup is the swelling of the subglottic region of the larynx, which is the narrowest part of the airway in children. Croup varies in its severity and can last anywhere from three days to two weeks. Most patients do not require hospitalization, as home treatment or prescribed antibiotics or steroids are typically sufficient. Though croup is most often seen in children, this woman developed a barking cough and mild, non-anxiety provoking stridor in the context of an upper respiratory infection. In this panoramic view note in particular the prominence and redness of the conus part of the vocal cords (indicated by white lines). Closer view. 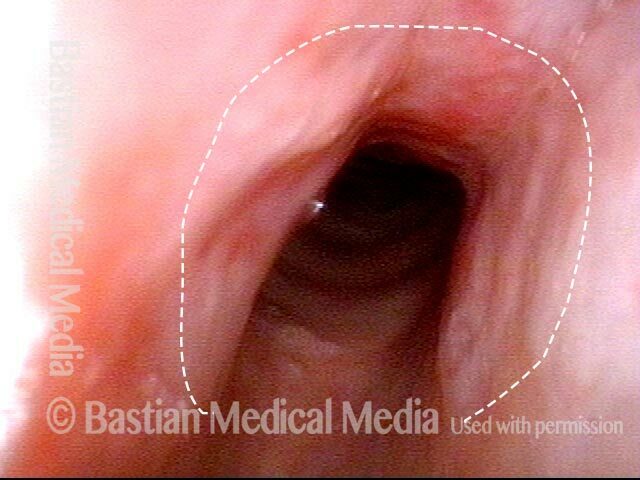 Dotted lines signify normal airway diameter. 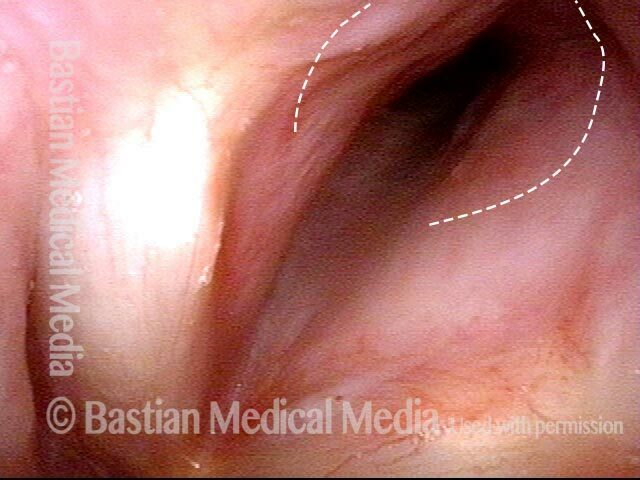 Even closer view showing redness and narrowing of the posterior subglottic airway. View within the posterior subglottic narrowing. 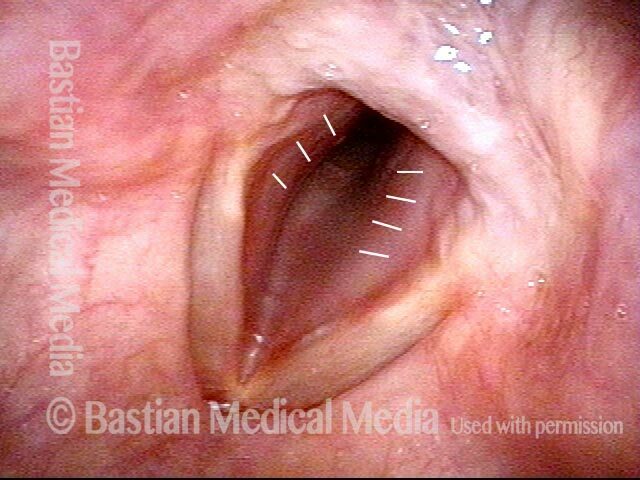 This entry was posted in Multimedia Encyclopedia and tagged Disorders, Inflammation/Laryngitis, Photos, Voice & other larynx disorders by admin. Bookmark the permalink.